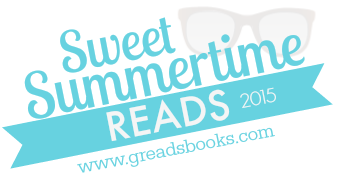 I’m so excited to have been invited back to Ginger’s blog to be a part of the Sweet Summertime Reads feature! (Thanks, G!) I’m very much a mood reader but don’t really read anything “in-season” except for spooky books at Halloweentime and select reads for the summertime! 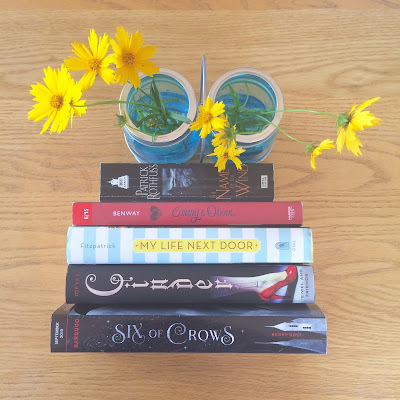 A summery book can be different for everyone, but for me it’s usually one of two genres that get me in the mood for summer: light and fun contemporary romances or action-packed sci-fi/fantasy. I know, I know. Those are two VERY different things, but somewhere along the way, those came to mean summer for me. I wasn’t a very adventurous reader until I hit my 20s and got back into exploring new books thanks to recommendations from my friends (Yes… It was Twilight.) so when I tried to tan out in the backyard, I needed something good to read! I turned to the bookshelves that my sister and I shared and it pretty much consisted of all of the Harry Potter books and my sister’s collection of Meg Cabot adult romances (I actually didn’t know about The Princess Diaries until after Meg’s adult books!) and I re-read these over and over and over again because we didn’t really buy books at that point in time. Thinking back on it, these two genres actually make perfect sense as for why they mean summer to me! Summer always means travel to me also! I don’t always take a trip but I at least usually go to BEA ever since I started blogging! Last year was the summer of traveling (I was out of the state three weekends in a row… to three different states) and choosing what book I’ll read on my plane rides is always so much fun! (I love photographing my travel reads too!) This year I was finishing A.C. Gaughen’s Scarlet trilogy on the way to BEA and naturally started reading SIX OF CROWS by Leigh Bardugo immediately on my way back! So far this summer, I’ve definitely dabbled in both of my designated “summer book” genres! I’ve fallen in love with Patrick Rothfuss’s Kingkiller Chronicle series (THE NAME OF THE WIND and THE WISE MAN’S FEAR), inhaled sci-fi books like RESONANCE by Erica O’Rourke (following up DISSONANCE) and ILLUMINAE by Aime Kaufman and Jay Kristoff, and I started re-reading The Lunar Chronicles starting with CINDER! 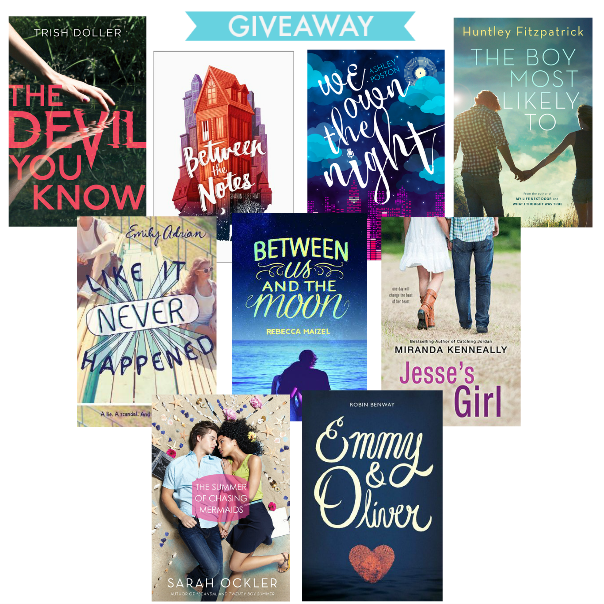 I’ve also gotten fully engrossed in some fantastic contemporary reads like MY LIFE NEXT DOOR by Huntley Fitzpatrick and EMMY & OLIVER by Robin Benway. It’s hard to say what else is in store for the summer since I ditched my read schedule this year! I’ve been picking up whatever book I’m in the mood for but I know I’ll be finishing the rest of my Lunar Chronicles re-read leading up to WINTER this fall (I’m actually hosting a read along (or re-read along) for the whole series with some help from Fierce Reads so keep an eye out for sign-ups!) and I’ve got my eye on FIRST & THEN by Emma Mills that I’d like to start soon! Thanks so much Brittany for sharing your summertime reading picks. I am 100% a mood reader too, so I completely understand not sticking to a schedule. I always have hopes to read certain books during the summer, and then something else jumps out at me and I pick that one up instead. And I can also relate to the Twilight thing (its what got me back into reading as an adult, too -- such a gateway book!!). Thanks so much for having me be a part of this feature!!! :) Always a blast! I live in Scotland and so far this summer the weather has been rotten! Though this is good for reading and going to the cinema. I'm looking forward to re-reading Paper Towns before I go to see the movie. I also can't wait to get my hands on Six of Crows. It's currently Winter here in Australia, so the perfect time for staying indoors and reading a good book. At the moment I've been gravitating towards fast-paced, thrilling books, trying to get out a slump. As always, my shelf is overflowing with amazing books to read! I really loved the summers of my childhood, because I grew up in Brooklyn and it meant: block parties, playing the fire hydrant, Dan the ice cream man, pony cart rides and the half moon visiting our street. I also meant summers in the country (well, upstate NY) and no school. The humidity is certainly a unique thing about the Midwest US, but I'm going to say county fairs. All counties in my state have a county fair, even the largest cities, and most people go to them. There are big name headliners at the concerts, livestock things, rides, everything. This summer I'm planning on reading the Throne of Glass Series (because I've bought all the books as they were released, including the original cover of the first one, but haven't read them yet...). My most anticipated summer release is Best of Enemies by Jen Lancaster (it was Armada, which already came out, and I already read, and it's AMAZING!). I'll always think of contemporary romance when I think of summer, but I've read plenty of fantasy this summer, too! I don't really have "seasonal" reads either. I think I'm way too much of a mood reader for that. And I'm with you on the fantasy and contemporary books, Brittany! They are my two favorite genres, and I read between them a lot, especially in the summer when I have more time and freedom. I LOVED Six of Crows and I can't wait to read Illuminae. I'm actually making it my first August book, and I'm so excited.